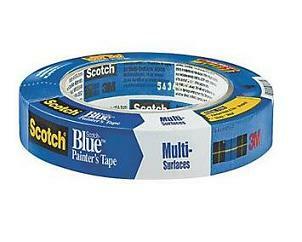 DESCRIPTION: Safe-Release Painters Tape for Multi-Surfaces. Removes cleanly without adhesive transfer or surface damage for up to 14 days, even in direct sunlight. It is a medium adhesion tape that is ideal for painted walls and trim, woodwork, glass and metal. Made in USA by 3M Brand. • 24 lbs. of tensile strength per inch of width. • Removes cleanly and easily for up to 14 days of UV exposure without leaving a residue. • Features easy tear and a controlled unwind for easy handling. • 6% elongation at break. • Temperature range 200 degrees F for up to 30 minutes. • Adhesion to steel: 20 ounces per inch of width. Green Masking Paper, 18 inch wide X 180 Feet Rolls. Premium Green Heavy Duty Paper. 12 Rrolls/Case. Price/CASE (2160 feet).